People are very conscious of their weight and their appearance nowadays. They're counting calories, going on diets, and of course keeping track of their weight. 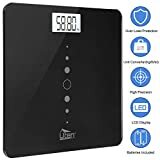 There are digital scales nowadays that give all sorts of information, such as BMI (= body mass index, a measure of your optimal weight according to your height) and body fat percentage. But some still want a no-frills, mechanical bathroom scale. Some mechanical scales can measure up to 330 lbs (150 kg), and are guaranteed to last for as long as 15 years. That's just an indication of how durable they can be. But there are still variations between what's available now. Here is a guide to some of the best mechanical bathroom scales on the market. Beam scales: You're probably familiar with a scale like this from seeing it in a doctor's office or health clinic. When you step on the platform, you have to balance out your weight by sliding two standard weights, known as “the poise”, on the off-center weigh beam. The larger weight is marked off in gradations of 50 pounds, and the smaller weight is marked off in individual pounds. Spring scales: When you place a weight on (or stand on top of) a spring scale, you compress a spring inside the device. This moves a lever, which in turn compresses a second spring. That spring moves the scale's dial. The dial is marked to translate the compression of the spring into the mass of the weight. Hydraulic or pneumatic scale: These use hydraulic force to sense the weight placed on the scale. 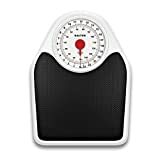 Easy to use: Part of the appeal of a mechanical scale, when there are so many electronic scale options available, is its simplicity: Some people just want to know their weight. They don't want to know their BMI, or what the weather is going to be today. (Yes, there are digital scales that even tell what the weather will be, in order to advise you how to dress.) They also don't want to be bothered with having to put batteries in the scale. Large display: Some people have trouble seeing the numbers on the scale (especially when they're standing at full height). The Salter scale has an especially large display: 7.5 inches (=19 cm) in diameter. Some scales (like the Health-O-Meter scale) also have a red needle on the display, for greater contrast. Accuracy: Some customers had issues with their scale's accuracy: They noticed that the scale had to be set back to zero after every weighing. Others noticed that the inaccuracy of a scale increased when heavier people stood on the scale. It is important to find these defects quickly, so that you can return the scale as soon as possible. 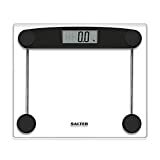 Remember to zero the scale: Some mechanical scales move away from the zero after a few uses. Make sure that you take note of where the scale's needle is when there is nothing being weighed. Length of the warranty: The length of the warranty is a good indication of how sturdy the product is. For example, Salter scales have a 5-year warranty. Place the scale on a level surface: Some notice that the scale won't give an accurate reading if it's not on a level surface. Some scales have adjustable feet to correct for that—but it's important to check for that. 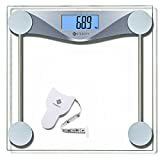 Gives weight both in pounds and kilograms: American customers probably are more familiar with their weight in pounds. European customers will probably prefer seeing their weight in kilograms. Some scales display in both units. Make sure that your scale displays your weight in the units with which you are familiar. VIVE—is a company based in Naples, Florida. They make a series of measurement devices: digital scales, blood pressure monitors, thermometers, and pulse oximeters. They also make walking aids, footcare implements, and safety products for the infirm. Salter—is a company that has been manufacturing scales since 1760. They were founded by Richard Salter, a spring maker, in Bilston, England. The company produced scales, as well as irons, mincers, potato chippers, and typewriters. 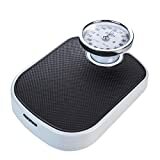 They now make both mechanical and digital scales, for home and medical use, as well as kitchen gadgets and blood pressure monitors. Detecto—was founded in 1900 by the Jacobs brothers. They started by making scales for commercial and health purposes. 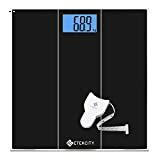 They now market a wide range of scales and weighing devices for healthcare, food service, and shipping/logistics industries. Their headquarters is located in Webb City, Missouri. Health-O-Meter—is a brand of Sunbeam Products, Inc. They make mechanical dial scales, digital scales, and beam scales. They also manufacture sleep tracking and monitoring systems. Greater Goods—are located in St. Charles, Missouri. 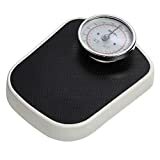 They make a wide range of measuring devices for health purposes: blood pressure monitors, kitchen and bathroom scales, as well as body composition scales that measure the body-mass index.